Cooler Master has launched the new Masterbox Q500L PC case. This product has been designed to allow the fitting of full-sized ATX motherboards, but keep the overall build size down. Other features of the Cooler Master Masterbox Q500L that are immediately striking are its fully perforated chassis, edge-to-edge transparent (acrylic) side panel, ATX PSU fitting in the upper front of the tower, and the movable I/O panel. As mentioned in the intro, a major feature of the Masterbox Q500L is its compactness. The measurements of the case are; 386(L) x 230(W) x 381(H) mm, and its unpopulated mass is 3.83kg. That's significantly smaller than the typical ATX mid-tower in my experience. While you can fit a full sized ATX motherboard inside, with 7 expansion slots, the case is compatible with Mini-ITX, Micro-ATX boards too. Of immediate concern with any compact chassis are the expansion, maximum compatibility, and cooling features. With regard to expandability, as previously mentioned the case supports up to 7 slots, as well as; fitting in up to 4x 2.5-inch devices in two combo bays, 1x 120mm rear fan (supplied), 2x 120mm or 2x 140mm fans in the top (or up to 240mm radiator with 35mm depth), and 2x 120mm fans in the bottom. CPU cooler clearance is 160mm, PSU clearance is 180mm, and graphics cards can be up to 360mm long (270mm if the PSU is longer than 160mm). Cooler master states that the mounting room behind the MB tray is approx 30mm. To aid cooling this is a fully perforated steel case (except of course the side panels of acrylic and sheet steel). 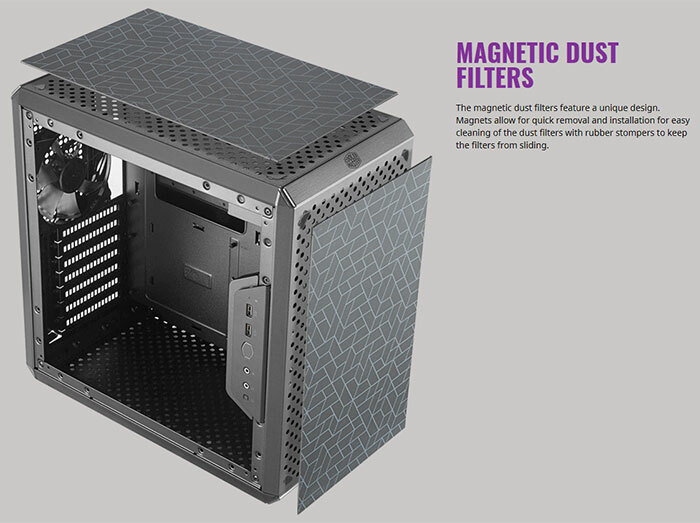 Cooler Master includes magnetically mounted dust filters with rubber stoppers for steady positioning. It is interesting to see the design choice of the PSU in the upper front of the chassis in its vertical orientation. The bracket that secures the PSU can slide to allow of extra radiator / graphics card clearance. Cooler Master says that the rubberised thumbscrews supplied mean that users can orient the case horizontally or vertically without worrying about their table surface. Extra flexibility is afforded thanks to the movable I/O panel, which can be relocated to multiple positions to retain accessibility. 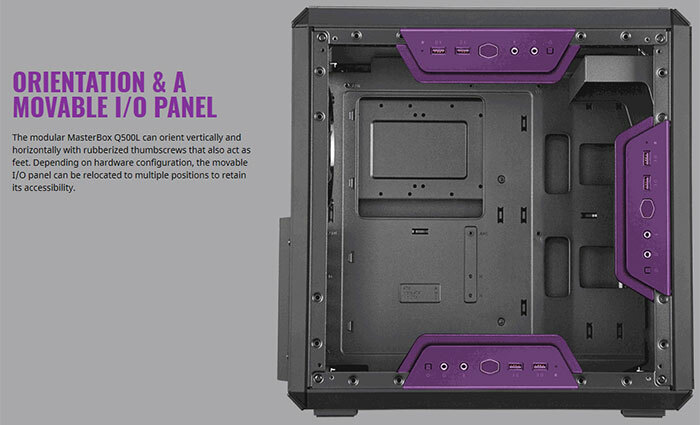 Cooler Master says that Q Series accessories, past and present, such as handles, feet, the I/O panel, and other panels are compatible with this case. If you are interested in the Cooler Master Masterbox Q500L, HEXUS was told that the case will become available in thew UK towards the end of April. RRP is £49.99 including VAT. Shame they don't make a Silencio version of this without the side window / perforated case. …not at £50 you wouldn't. I like this, Looks like time for a case upgrade to me.